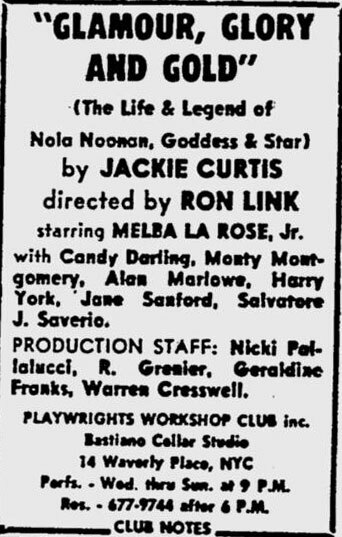 The first production of Jackie Curtis' play, Glamour, Glory and Gold (The Life & Legend of Nola Noonan, Goddess & Star), opened during September, 1967 at the Playwright's Workshop Club at the Bastiano Cellar Studio at 14 Waverly Place in New York. The first ad in the Village Voice for the production was in the September 14, 1967 issue. The previous issue of the Voice, the September 7th issue, advertised a different production at the venue - Zichenete by 'Ntoni Bastiano. Glamour must have opened at some point between September 7th and 14th. Melba LaRose, Jr. recalls, "We were sold out nearly every night and I became Queen of Off-Off-Broadway overnight. It was dubbed the play that started 'camp,' though we thought we were very serious. Critics were there opening night and we received a rave review in the New York Times. Dan Sullivan said I was 'Jean Harlow down to the leaden voice and incipient pot belly.' And Candy was reviewed as a woman: 'This is the first impersonation of a female impersonator I have ever seen.'" An interview with Melba LaRose can be found here. 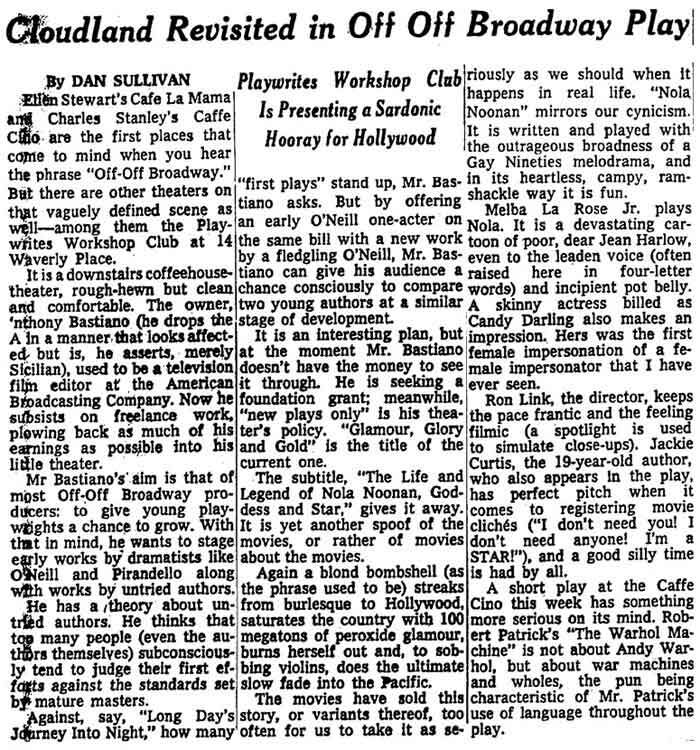 The last ad for the 1967 run of the play was in the October 19, 1967 issue of the Voice, advertised as "Held Over - 6th Smash Week." By the November 2nd issue, the run of the play was over. The ad for the Playwright's Workshop in the November 2nd issue of the Voice advertised the "Theatre of the Eye" in repertory. The next production of Glamour, Glory and Gold took place the following year and featured Robert De Niro in the cast.